Berry Hill, located on the Dan River, was built in four sections for four different families. Around 1745 the first section was built by Peter Perkins on land that his father Nicholas Perkins had willed to him. This section is almost lost, but it remains unique with its long sloping roof, covering the porch and an end room. It has a fine old chimneys laid in Flemish bond with glazed headers, and its ceilings and mantels are high. One of Peter Perkins’s daughters, Alcey married Peter Hairston (1752-1832), son of Robert and Ruth Stovall Hairston. The first addition to Berry Hill was made in 1843 when an elegant little story-and-a-half house was built. It has beautiful chimneys, designed with graceful slopes and breaks. Even though hooked onto its brothers and sisters, it is probably the most admirable addition. The third addition was joined at some later time and has a broad rock chimney. The fourth addition was made in 1910 with a two-story house dominating the family cluster and pulling it all together into an intriguing unit. The whole home gives harmony to the whole. 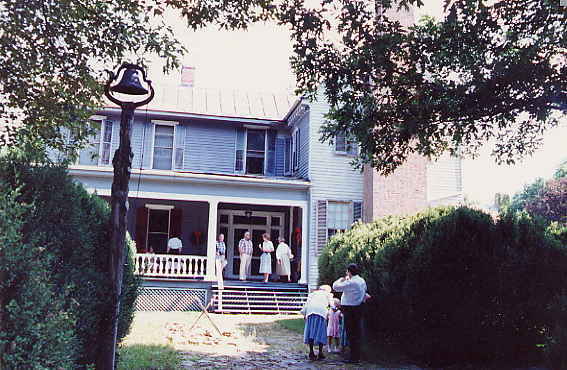 After the Battle of Guilford Court House in 1781 during the American Revolution, Berry Hill became a hospital for the wounded. This story is told in Maude Carter Clement’s "The Turn of the Wheel". An old family story also says that Berry Hill served as headquarters for a French general a few days before the retreat from Guilford Court House. Berry Hill was probably used for a large encampment at some time because a great flood in the Dan River, prior to 1890, washed the soil away and exposed a number of Revolutionary muskets, bayonets, and camp kettles. It is also legendary that a musket ball from the fighting hit a chimney of this home. This large estate was said to have originally been named Buryhill because of the large number of British soldiers who died and were buried here. This story seems to verify the above story. Averse to a change in the name, which for generations had identified the place, the name was changed only by two letters, making the attractive name of Berry Hill. BERRY HILL, Pittsylvania County, is one of the Colonial places of Virginia, probably the oldest place equally far inland. It was the home of the Hairston family, who originally inherited it from the Perkins', into which family the Hairstons' ancestors married. It has never been sold, but has passed down from the original grant from the King of England only by successive wills for about three hundred years, and is now the property of Mrs. Ruth Hairston Sims, who inherited it from her great-grandmother. It is located on Dan River, in Pittsylvania County, Virginia, and Rockingham County, North Carolina, and happens to be at the point where the Colonial army, under General Greene, crossed this river in his famous strategic retreat before the army of General Cornwallis after the battle of Guilford Courthouse. After effecting the crossing of Dan River under great difficulty, General Greene camped his army on the river bank, where he prepared to, and did, offer resistance to his pursuers. The heavy rains under which this crossing was effected caused the river to rise abnormally and cover the extensive bottom lands, forcing General Greene's army to move back on the flat land. Cornwallis' forces drew up on the bluff on the right, or south, bank of Dan River, from where his artillery opened fire. The Berry Hill house, in which General Greene had taken up his headquarters, overlooked this crossing and battlefield, and in the cannonading the old outside chimney that served General Greene's room was struck but not wholly destroyed, and was later successfully repaired. There has been some controversy as to the exact spot on Dan River at which General Greene's crossing was effected, but this was finally settled in 1896 when the unprecedented severe freshet covered the entire bottom, washing the land and exposing not only the smoked stones that had been used around the campfires of General Greene's soldiers, but the remains of some of the old revolutionary muskets, as well as bullets, bullet-moulds and lead. Incidentally, the fact that these pieces of equipment were left, would indicate that the retreat of General Greene's men to the higher flatland adjoining the bottoms was due to fire from across the river as well as to the rising water. The high water that occurred at this time evidently buried these articles, and succeeding freshets covered them deeper and deeper, until they were between three and four feet under ground. The successive layers of this covering were clearly discernible when the freshet of 1896 scoured the land away down to the original level of the date of General Greene's crossing. It may be of interest to remark that at the time of General Greene's crossing the land on which he camped was a clover field. This fact was evidenced from the circumstance that after this three to four feet of earth was washed away the land soon became covered with clover, sprouted from the seed that had lain buried for over a century —incidentally proving that the seeds of some plants retain their vitality indefinitely if sufficiently far under the surface of the soil. The original house was made entirely of hewed lumber, even the flooring having been made of puncheons split out of logs from the original forest. Some of these puncheons are still in place. The oldest part of the house was added to some time before the Revolutionary War. The laths were rived, and the nails used to fasten them were made one; by one, by hand, in a blacksmith shop. Grass was used as a binder for the plaster. In about 1806 the socalled "new part" was added. The gable end of this part, with the outside chimney, is shown in one of the views of the north side of the house. The last addition, which is shown with the porch extending around it, was made by the present owner in 1911. On the west side of the house is the garden, which is still surrounded by its ivy-covered stone wall. The eight beds composing this garden are each surrounded with the dwarf variety of boxwood, much of which is now over six feet high. Of this boxwood hedge there is almost a half mile. To the west of the garden adjoining it is the old Hairston family cemetery. The summer-house is built of hewed locust and, though small, yet picturesque, is one of the older structures, though its exact age is not known. It is known, however, that about 1840 the then older members of the Hairston family were at that time speculating as to what previous ancestor had built it. For more historical information about Berry Hill Plantation, please see the National Register of Historic Places Inventory - Nomination Form.